ormolu: Also called mosaic gold, an alloy of copper and zinc used to imitate gold. reticule: a small purse or bag, originally of network but later of silk, rayon, etc. I have always liked the word reticule. 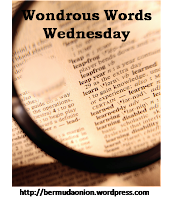 Here is my Wondrous Words Wednesdays post! I found lots on new words in The Magicians, and that's one that I have written down, so it's new to me as well! Thanks for participating! Great words this week Julie...Reticule I may be able to use. Reticule is one I know from reading historicals. I've never referred to my purse by that word. Now it's just a bag. I also had ormolu, but from a different book!